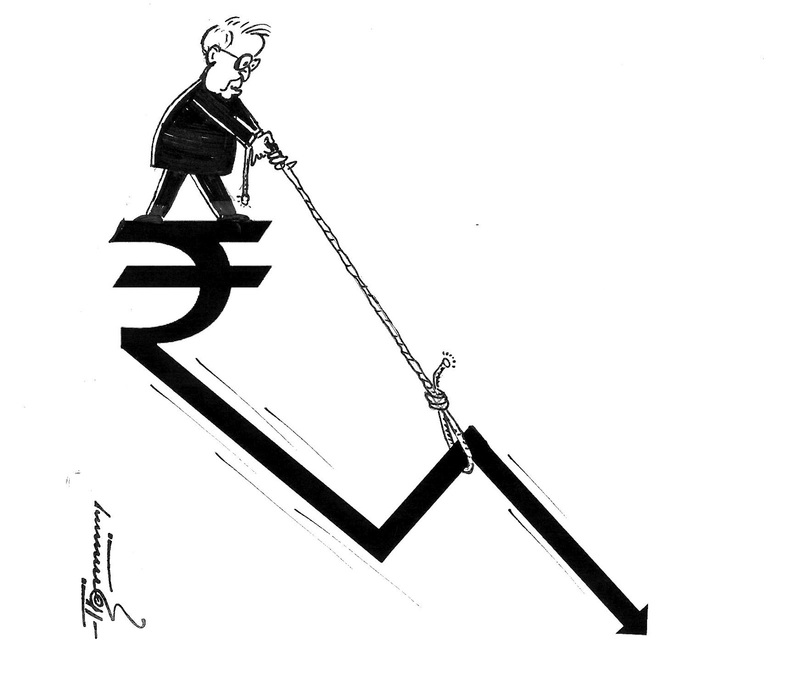 Arvind's World: Why is Rupee falling ? - understanding the dynamics of a bigger picture ! Why is Rupee falling ? - understanding the dynamics of a bigger picture ! "The only time the Indian Rupee goes up is during a Toss." While it may seem as one of the latest whatsapp/text jokes, the serious implications of a depreciating Rupee (currency) are many. Has it all happened too suddenly? Does it mean that the country is in for some major trouble? Does it spell doom? Is it all Oil (POL) driven induced by the misuse of petrol? Is it because of continuous gold imports? What are the reasons for this sudden depreciation? The media, especially the e-media has gone hyper again highlighting the depreciation of Rupee (INR) for the last month or so and it was proving to be a self-fulfilling prophecy. It's almost hilarious how everybody became an expert on Rupee depreciation. I was particularly amused when I watched one evening, to my utter horror, actor John Abraham (with due regards) talking about Rupee depreciation and what should be done to control the rot! Another interesting dimension being gossiped these days is how the design of Rupee logo isn’t proper and Rupee will continue to suffer unless the design is changed! My daughter asked me to explain the other day in very simple language, reasons for decline in Rupee value, the entire dynamics and what can be done immediately and in the medium and long term to stabilize the exchange rate. While some reasons to me were coming obvious, putting them in simple language by giving the bigger macro picture is what has prompted me to make an attempt now to examine this issue. Exchange rate: An exchange rate, between two currencies, is the rate at which one currency is exchanged for another. It used to be a fixed exchange rate system under Britton Woods (till late sixties), moving to adjustable peg system (for eg Chinese RMB was pegged to US$ from 1994-2005) and finally moving to floating exchange rate system which is based on the demand and supply of the currencies. A currency will tend to become more valuable whenever demand for it is greater than the available supply. It will become less valuable whenever demand is less than available supply (this does not mean people no longer want money, it just means they prefer holding their wealth in some other form, possibly another currency). The down-slide of Indian Rupee - Now let’s see the fall in rupee in recent times. Indian Rupee has been highly volatile in the recent past, and has depreciated significantly vis-a-vis USD. Among select Asian currencies, the Indian Rupee has depreciated the highest on a y-o-y analysis, as of August 2013, though most of the Asian peers are also oil importers. Additional supply of US$ in US has a ripple multiplier effect in emerging economies including India. To revive the US economy, the Federal Reserve has been pumping out $85 billion of cash per month (called Quantitative Easing). The fiscal cliff, supposed to be from early 2013, in the US had been deferred, albeit temporarily. As a result, growing investor optimism had translated into ‘risk on’ behaviour, which led to a surge in capital flows to emerging economies. The renewed confidence has also led to ‘great rotation’, with investors shifting money from ‘safe haven’ government securities to equities in search for yield. The change is reflected in the equity market boom in advanced and emerging economies. A risk-on, prompted by new policy initiatives, creates a favourable disposition towards emerging economy investment, leading to surge in FIIs flows. This increases the supply of liquidity in the system due to QE and together with low interest environ and better growth prospects in emerging economies, contributes to increase in capital flows. The additional factors leading to improvement in the investment climate from July, 2012 inter-alia included (i) announcement by European Central Bank President that the euro would be saved at all cost; (ii) proposal to set-up Banking Union in the euro zone; and (iii) launch of permanent European Stability Mechanism. Thus, while trade deficits in India continued to be more than 10% of the GDP and CAD more than 4.5% of GDP in 2012-13 and first half of 2013-14, a welcome feature during 2012-13 post July, has been that this high CAD had been funded by capital inflows arising on account of QE through FIIs. There has however been high dependence on volatile portfolio flows and external commercial borrowings and this makes capital account vulnerable to a 'reversal' and 'sudden stop' of capital, especially in times of stress and resulting “risk-off” behavior. US Federal Reserve Chairman Ben S. Bernanke, in June 2013, has put investors on notice that the central bank is prepared to begin phasing out QE3 and will probably taper its $85 billion in monthly bond buying later in 2013 and halt purchases around mid-2014 as long as the world’s largest economy performs in line with Fed projections. With Federal Reserve Chairman Ben Bernanke signaling an end to quantitative easing, investors are looking ahead to rising interest rates in the U.S.—and rethinking their willingness to tolerate risky emerging markets. As they do, India’s currency is taking a particularly painful beating. Emerging markets like India have long enjoyed a slice of this $85 b/month. Not only will fresh flows stop, older flows will reverse to the US, a net turnaround of hundreds of billions as a result of “risk-off” behavior. This storm has knocked the Rupee down almost 25% in two months. It is the first of many storms that will hit not just India but the whole developing world, with every tightening of the money tap by the Fed. The net impact of tightening of QE by the US on a country will depend on its Current Account Deficit (CAD). If a country is a net exporting country (ie it has a current account surplus and it gets US$), it will gain from such a tightening. But if a country has CAD (when imports exceed exports and thus a net outflow of US$, it’s currency stands to depreciate as the relative value of US$ increases). And this is what has happened to Indian Rupee and while the growing CAD is the main reason, the trigger for the sudden drop in the value of Rupee post June 2013 has been phasing out of QE by the US. 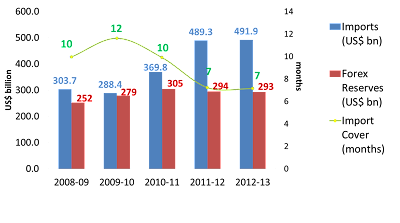 The Exports and Imports for 2012-13 have been 300,570 and 491,487 million US$ and with a trade balance of US$ 190,197 millions. Of the imports, crude oil imports have been US$ 169,396 millions (about 34% of all imports) and the oil deficit (excess of imports of oil & POL products over its exports) at US$ 109,392 millions is 57% of the total trade deficit. The exports during April-July 2013-14 grew by 1.72% while imports grew by 2.82% widening the trade balance gap. While the capital flows increased during 2011-12, it has tapered off during 2012-13 and the CAD gap thus had to draw from the Foreign exchange reserves. While the trade deficit has been more than 10% since 2011-12, the CAD @ US$70 Billion or 4.8% of the GDP has been a cause of concern. While the imports on account of crude oil has been going up, both on account of increasing quantity and also the increasing international prices, what’s cause of concern has been the equally larger share of imports of manufactured products. Growing manufacturing imports: One of the major reasons for the volatile behaviour of Rupee has been mounting trade deficit triggered by growing manufacturing imports. The trade deficit increased significantly from US$ 119 billion in 2010-11 to US$ 192 billion in 2012-13. Manufactured imports, which increased from US$ 140 billion in 2010-11 to USD 167 billion in 2012-13, accounted for nearly 80% of the trade deficit, and almost double that of India’s current account deficit. This is primarily due to the weak manufacturing sector domestically. Manufacturing sector performed below the potential due to certain policy aberrations, unfriendly labour and environmental regulations, land allocation policies, and somewhat confusing signals being sent to international investors. This coupled with slowdown factors, as also the overall low business sentiments across the world, have been deterring fresh investments into the economy, which is also reflected in the decline in capital formation in the manufacturing economy. Capital formation in manufacturing has been stagnant for the several decades at below 32% of total GDCF, while the share of capital formation in services sector has grown from 39.3% in 1970 to 51.0% in 2010. Import of high-end manufactured products (capital goods, electronics and chemicals) led to a widening trade deficit. Import of these three product categories amounted to US$ 103.7 bn in 2012-13, accounting for 53.6% of trade deficit, and 118% of CAD. While I can understand the relative inelasticity of demand for crude oil, the growing imports in manufacturing sector certainly are a dangerous pointers to the systemic inefficiencies in domestic manufacturing sector and their increasingly becoming uncompetitive. The share of gold imports is continuing. While one may question the obsession with the yellow metal, this is considered a safe investment in the absence of a viable safe and growing alternative. 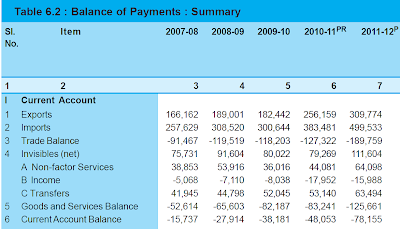 Surplus in Services Trade not Adequate: The growth in services trade could not compensate for the trade deficit to the full extent. 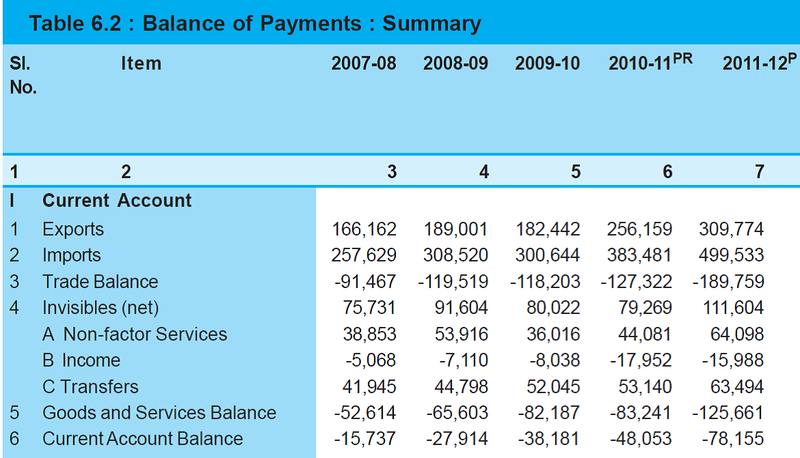 During 2008-09, the surplus in services trade covered nearly 46% of the trade deficit. This coverage has come down to 34% in 2012-13. Software exports that account for around 45 % of the overall services exports have also witnessed a decline in export growth. Challenges in the Capital Account : The deficit in current account transactions needs to be compensated with a surplus in capital account to manage the balance of payments, and keep intact the reserve position and thereby stabilisation of home currency. However, the slow down sentiments across the world, and within the domestic economy have catered to decline in capital inflows (both FDI and FII). 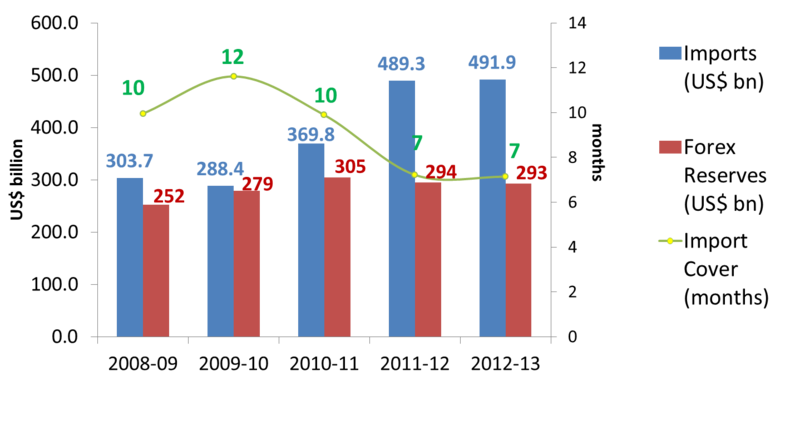 While FIIs found India less attractive due to slowing down of economy, FDI inflows hampered due to unstable policy. 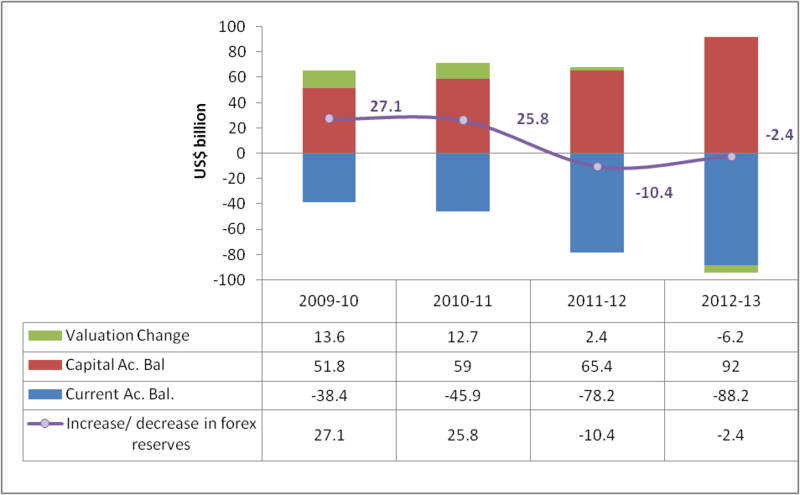 As the capital account could not fully compensate the CAD, there has been decrease in forex reserves both in 2011-12 and 2012-13. Decline in Forex Reserves: The resultant factor has been the decline in import cover from 10 months in 2010-11 to 7 months in 2012-13, which further has remained at 7 months as of end August 2013. 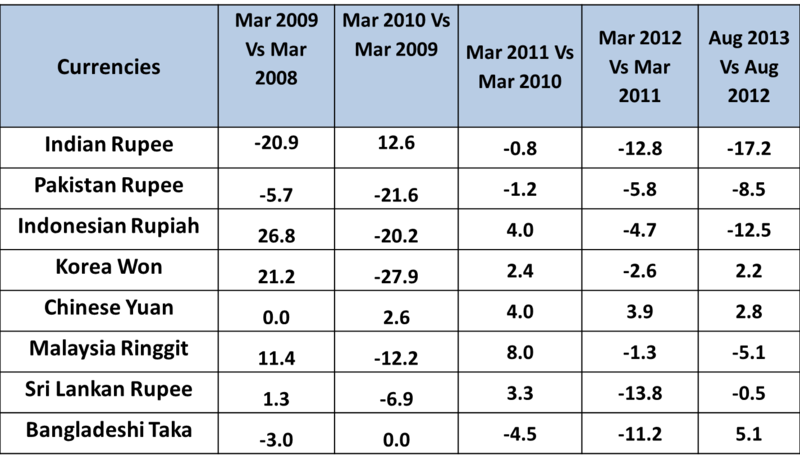 Deterioration of External Debt Profile: India’s gross external debt has also increased in the past five years, from US$ 224.5 bn as on March 31, 2009 to US$ 390 bn as on March 31, 2013. 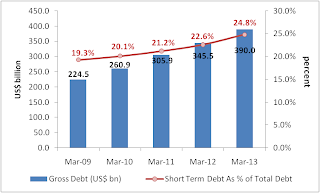 Short-term debt as a per cent of total debt has also increased from 19.3 per cent to 24.8 per cent during the same period. The ratio of volatile capital flows (defined to include cumulative portfolio inflows and short term debt – in other terms, hot money) to reserves has also increased in the last six months from 83.9% as at end September 2012 to 96.1% as at end March 2013. According to RBI estimates, external debt obligations remain large with around $172 billion worth of short-term residual maturity external debt due for redemption by March 2014. Is oil imports the culprit/only culprit ? While the growth in domestic production has been a mere 10.7% during this period, the growth in imports has been 45%. The share of domestic production of the overall consumption came down from 26% in 2004-05 to 18% in 2011-12 while that of imports went up from 74% to 82% for the same period. 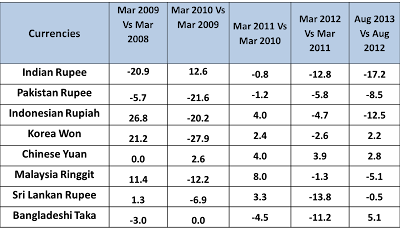 As we can see, the percentage increase for the period 2002-03 till 2012-13 in the total bill on account of oil imports (9.16 times) is more than the actual increase per price of crude oil in US&/BBL (4.19 times) and that’s because of increasing quantity of crude oil imports too. In a way, it’s double whammy. As per an OECD study (Wurzel et el 2009 – OECD Economics Department working papers No 737), a $10 increase in oil price reduces the activity from second year by 2/10th of a percent and increases inflation in the first year by 2/10th of a percent and another 1/10th in the second year. These multiplier exclude dynamic effects such as downward adjustments in personal savings, toll on potential growth and detrimental effect of price volatility on business investments. RUPEE DEPRECIATION AND IMPACT - Though the currency depreciation makes our exports competitive, it highly impacts our import bill also, and thus triggers inflationary trends. Rupee's depreciation has a direct link with escalating non-Plan expenditure, two biggest components of which are interest payments and subsidies. External debt servicing cost in terms of the rupee, due to the latter's depreciation, shoots up, putting a strain on the exchequer. Stock markets have also been in disarray bringing down the overall business sentiments. Though Indian Rupee has become highly volatile due to various market sentiments including the US Fed’s announcement, there are clear issues that are intrinsic to the Indian economy that needs to be addressed soon, primarily aimed at reducing trade deficit. Short term options: the need to control imports of non-essential manufacturing items is a must at this moment to control outgo on imports. The Finance Minister has announced yesterday (September 7th ) that the Government plans to take some "hard decisions" to trim wasteful expenditure and curb the import of non-essential items to deal with the stressed economic situation. As a prelude, the Government last month slapped a 36% duty on import of flat-screen television by air-travellers. However, these measures should only be temporary and the real answer lies in making the manufacturing sector in India more competitive. Otherwise, it may be seen as return of "permit-Raj". Government may consider settling trade transactions through local currencies with select countries. Government may also consider currency swap mechanism with select countries to boost the market confidence. Another key element could be the economic pricing of fertilizer (urea) and petro products which would encourage their efficient use and lead to saving of foreign exchange. While the need for a rationale use of POL is unquestionable, the hype created over it in the media is exaggerated. Central Government, in consultation with State Governments may identify Hi-tech zones / sector specific manufacturing zones, and provision of fiscal and financial incentives and preferential procurement policy that would attract Greenfield FDI. Establishment of fast track ‘green channel’ single window clearance mechanism, including environmental clearances for such projects, rule-based clearances, including pre-notified clearances in such identified hi-tech / manufacturing zones, keeping in mind the parameters for Doing Business Index in which India scores relatively less. Provision of uninterrupted power-supplies and other infrastructure facilities in such zones. The existing cap on plant and machinery for MSMEs need to be revised upwards so that they move up the value chain, through technology up-gradation and quality compliance. Indian firms need to be encouraged to invest in R&D which will position them technologically strong. India, on the lines of being provided in Canada, may consider providing dual tax credit allowances system that rewards both incremental expenses in R&D as well as the level of spending in R&D. Additional tax credits for SME units engaged in R&D activities could also be considered. On the lines of concessional financing support provided by Brazil (through BNDES), India may also like to consider encouraging sourcing of locally produced capital goods and ships. On the lines of Shipping Funds established by Governments of China and Korea, India may also consider establishing a Shipping Fund, and encourage procurement of ships from domestic ship yards. A Special Medium Term Refinance window or TUFS like scheme may be announced for supporting technology development of various manufacturing sectors. Labour regulations may be relaxed for such investments; contractual employment arrangements may be permitted with higher average salary package (10-15% higher than normal package) and with higher social security benefits (like PF, gratuity etc). This needs serious discussion. You cannot be purely academic in your viewpoint. Governance or the lack of it is a major cause. Everything you point out is correct but there is a fairly large elephant in the room you choose to ignore. I am willing to forget about the ungovernables, I understand NDF market is out of India's control etc. The question you must ask is simple- running a CAD within limits is an issue of governance. Why was it not done? Having been a forex trader in my life, I know what all of us used to trade on. Fear or confidence. Indian economy runs on fear now. Its currency will get beaten down.